WHAT DOES YOUR NAVEL REVEAL ABOUT YOU? Take a few moments and be totally honest in your answers to this short questionairre about your Belly Button and it will Instantly give you a little insight into the true you! examined by an experienced Navel Gazer such as myself, or by studying the contents of my book above which will teach you how to accurately read your own and other peoples Navels. THE REST OF THIS RIDICULOUS ARTICLE WAS THEN FULL OF LIE’S – According to Ally Ross I told Christine Hamilton she was Pregnant – watch the video earlier on this page and you will see THAT IS NOT TRUE. I actually predicted that someone in her family will be having an addition to the family in the future so there is still time for someone in her family network to get Pregnant this year and thus prove my prediction to be 100% Correct. He also seems to totally ignore the major hits I got with the other guest! Well thats modern day journalism for you! 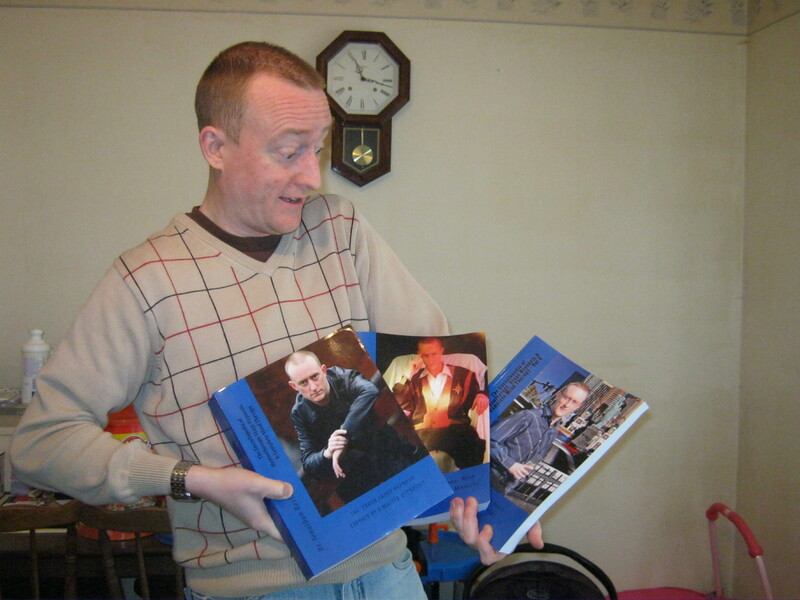 In The Past ROYLE has displayed his talent of “Navel-Gazing” to reveal Celebrities pasts, present and futures on such TV shows as Big Brothers Bit On The Side, ITV’s “This Morning, “UTV’s – “The Kelly Show”, BBC’s – “FOT”, UK Livings – “Live at Three”, C4’s – “The Big Breakfast”, ATV’s – “The Warehouse”, Granada’s – “The Zest Health & Beauty Show” and Sky’s – “Psychic Livetime” amongst numerous other feature TV appearances as a Psychic Entertainer on German RTL and Pro 7 Stations to name but a few! 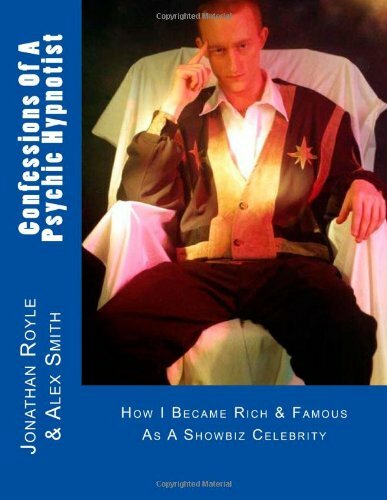 And He has consistently made accurate Psychic Revelations and Predictions on various radio shows including those for BBC Radio Scotland, Dublin FM, BBC Radio Belfast, GMR, 210 FM, Talk Radio UK and every morning for a week on Derby FM’s Breakfast show amongst many others. 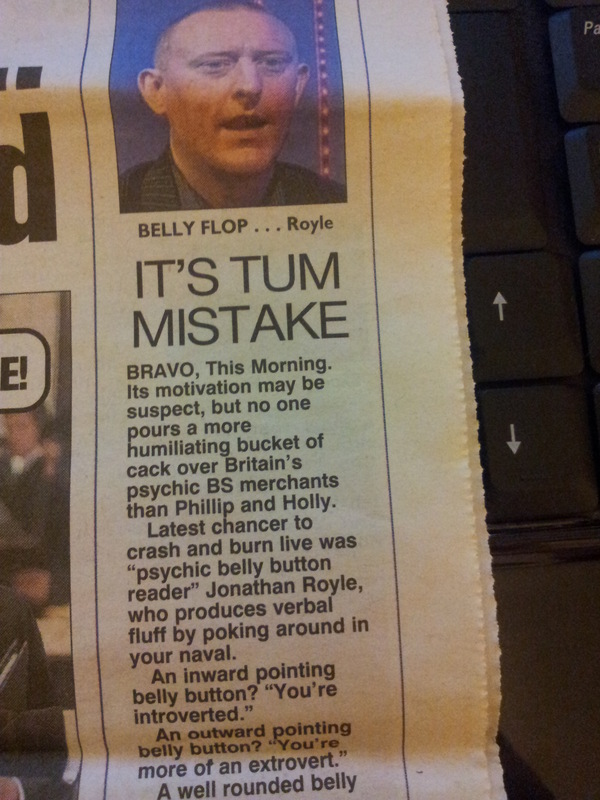 Royle has demonstrated his bizarre talent of Psychic Belly Button Reading on TV & Radio shows all over the World! By examining the persons Navel, Royle is able to tell them all about their past, present and future in a way that has proved to be uncannily accurate. 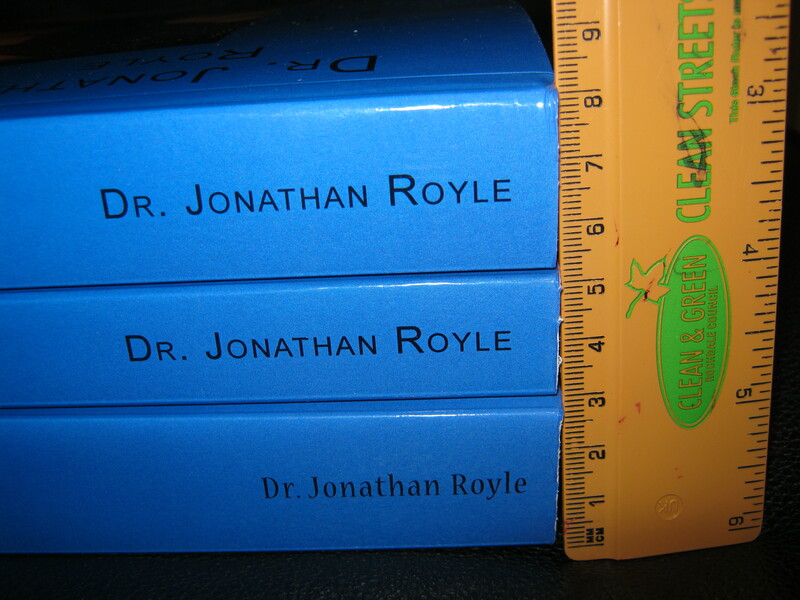 The most amazing readings are obtained when Royle is face to face with the person whose Navel he is examining, although slightly less accurate (but still amazing) readings can also be obtained from good clear photographs of the persons navel for newspaper and magazine features! Just like Navel Reading, Royles bizarre approach to Psychic Healing is also based on the Ancient American Indians Belief that we have seven energy points in our bodies called “Chakras” and that one of these the base chakra is practically in line with the human navel. All Royle then has to do is place his finger into the persons navel and tap into their energy to tell their past, present & futures or place a pointed quartz crystal into their navel and send positive healing energy into them to help speed up their healing in conjunction with and not as an alternative to conventional medicine. 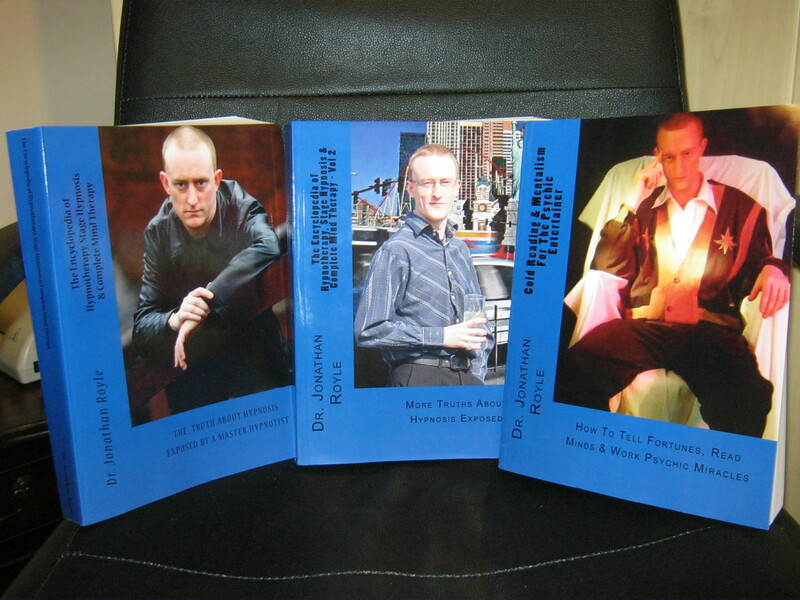 Royles “Psychic Strongman”, “Bucket of Ice” and “Strong Arm – Weak Arm” experiments are highly visual and prove beyond doubt that Navel Healing actually works! 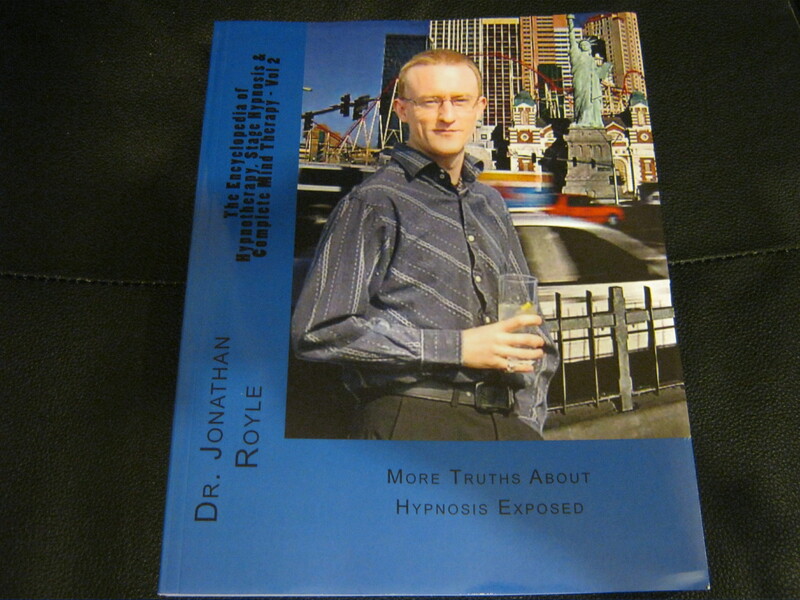 Navel Mind Reading is Jonathan’s demonstration of how he is able to tap into the Base Chakra in line with the Belly Button to read the minds of his volunteers and this makes for compelling viewing with his “Lie Detector” and “Psychic Proverb” experiments. 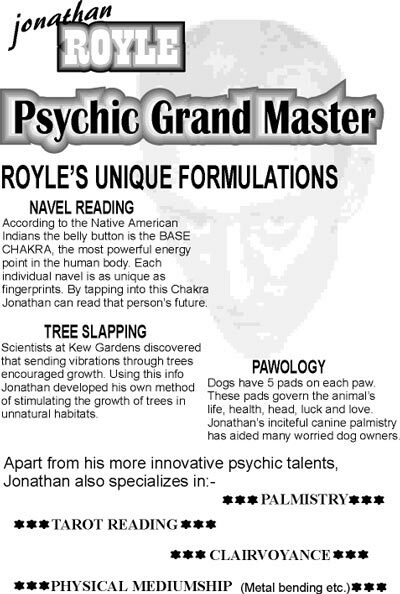 Pawology is the name given to Royle’s bizarre technique of palm reading for dogs! By looking at and feeling the dogs Life, Head, Love, Luck & Health pads on its paw, Royle is able to reveal much about the dog (and its owners) past, presents and future with results which are amazingly accurate. 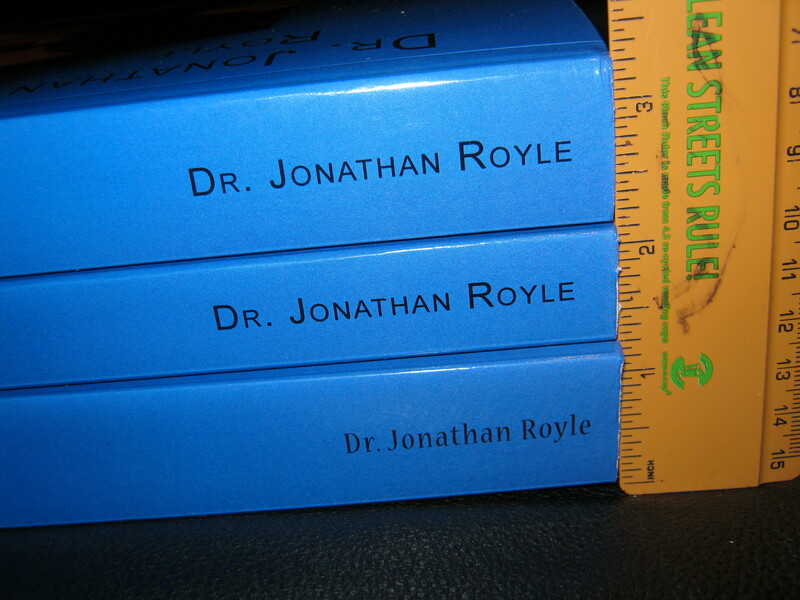 The most accurate readings are achieved when Royle is with the dog for real, however good readings can still be achieved from a clear paw print and clear close up photograph of the dogs paws which also makes this talent ideal for radio shows and publications who can get their listeners or readers to send these things in! 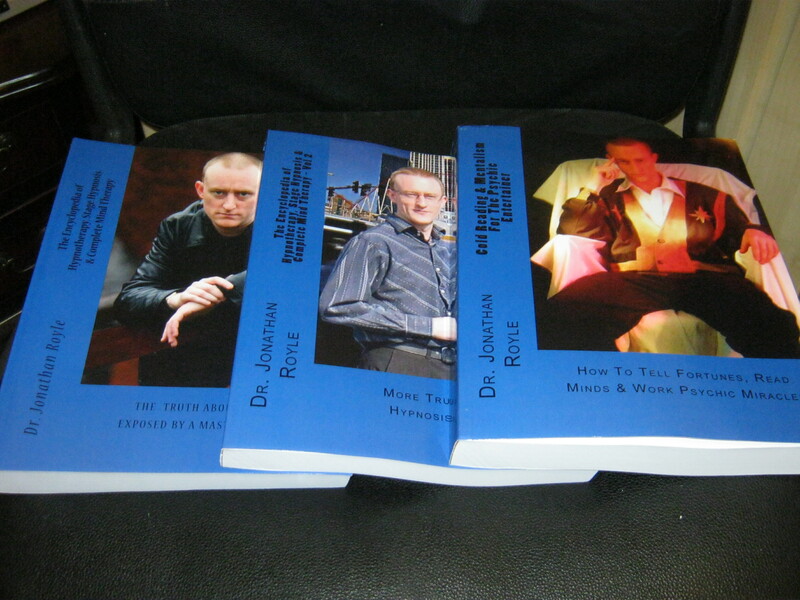 Royle can also duplicate all of the stunts which made Uri Geller and other so called genuine Psychics famous such as: making metal objects visibly melt, twist, bend and snap at his fingertips, making broken watches start and compass needles move by mindpower alone, making the hands of watches move on hours whilst held in their owners hands, making objects move without touching them, so called Psychokinesis, dowsing to find hidden oil and diamonds, in fact Royle can duplicate just about every Psychic Feat you could possibly imagine and as such can tailor material to suit your TV or Radio show. 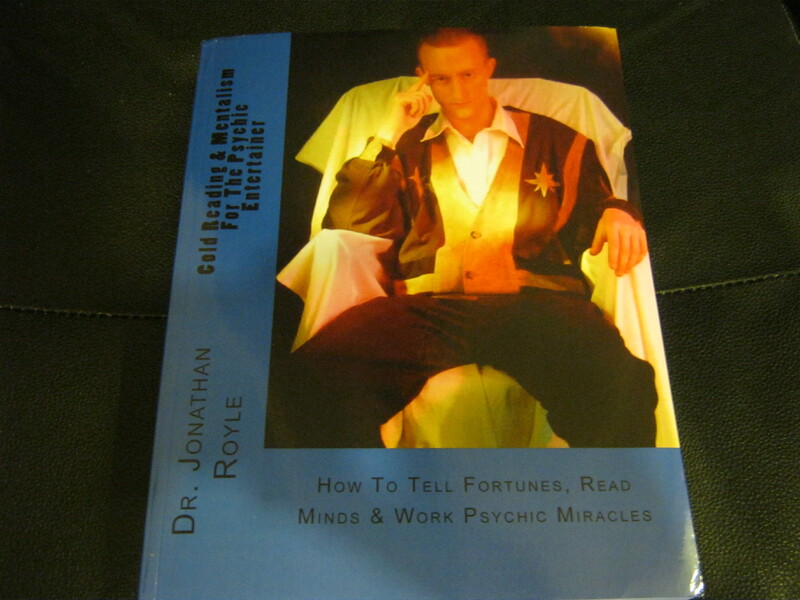 Royle is also available to demonstrate other so called Psychic talents and practices such as Fire Walking, Psychic Surgery, Spiritual Healing, Remote Viewing, Astrology, Tarot Reading, Palmistry, Crystal Gazing, Psychometry and indeed just about everything and anything you’ve ever seen or heard of a so called genuine Psychic doing! 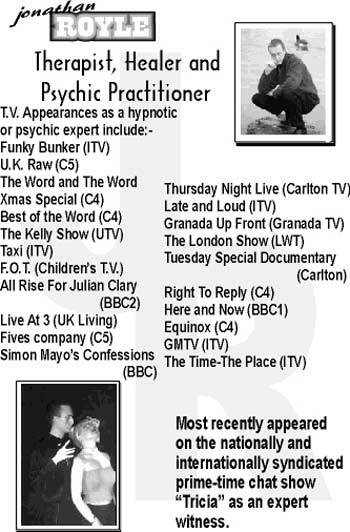 He can duplicate amazing ESP experiments with ease, predict the newspaper, sporting or lottery results weeks in advance and in short using his talent for trickery combined with GENUINE INTUITION, Royle can convince your viewers, listeners, readers or audience that he’s a real bona fide Psychic and then explain just enough about how it was all done so that they realise that Psychics don’t exist! 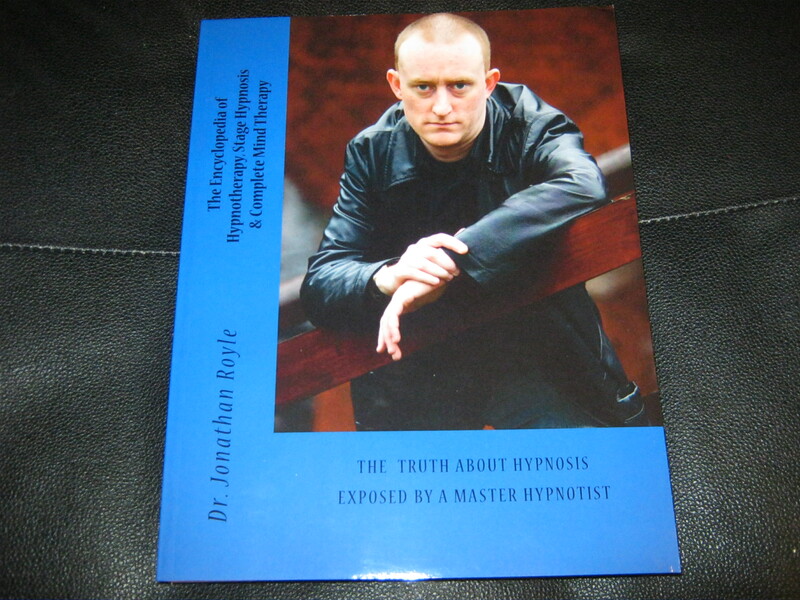 Firmly Established and Recognized as one of the Worlds Leading Authorities on all Things Hypnotic, Royle is both able to Hypnotize your Guests to perform Amusing and Entertaining things as well as being able to Eliminate Habits, Fears, Phobias, Addictions and other problems in a matter of minutes making for often Dramatic, Emotional and truly uplifting Television & Radio Feature Slots and engaging Media Articles. I predicted that Geri Halliwell (Ginger Spice) would be the first to leave the group to follow her own solo career and further predicted that her solo career would not be totally successful until she became Britain’s answer to Madonna. 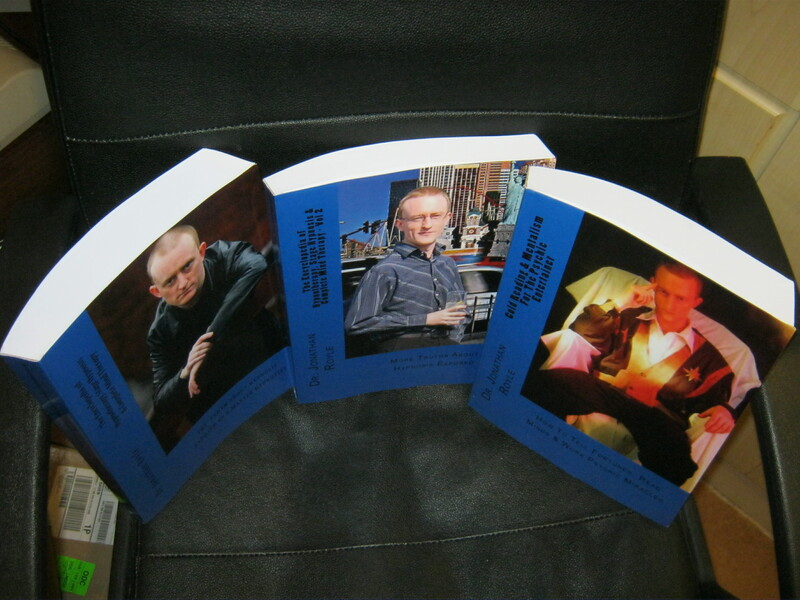 Whilst Celebrities for whom I have been commissioned to read the Navels of for features in major media publications include: The Spice Girls, Madonna, Tom Jones, Cher, Claudia Schiffer, Sean Connery, Jeremy Beadle, Prince Charles, Princess Diana and numerous others. 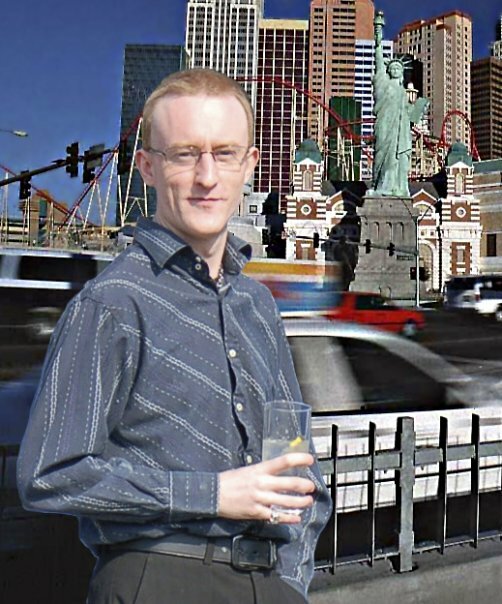 This means that a small tiny fraction of The Base Chakras Energy is within the photo and as such you can still tap into this for inspiration during the reading, which in this case is very akin to the Psychic art of Psychometry in which you hold peoples personal objects to reveal things about them – well how more personal can you get than a photograph of themselves? Navel-Gazing which is the technical name for Psychic Belly Button Reading and is a way of examining a human beings Navel in order to reveal their Past, Present and Future!! Navel-Gazing is based on beliefs and experiences, which are hundreds of years old, including those of The Native American Indians. 1) The more a Persons Navel sticks outwards, the more extroverted and confident they tend to be. 2) The more a Persons Navel sticks inwardly, the more introverted and shy they tend to be. 4) People with a Horizontal line/dent across their Navel tend to be very down to earth, they call a spade a spade and are very realistic and relaxed about life. and when they lose it boy do people know about it. Once their minds are made up they won’t listen to reason even if it means shooting themselves in the foot in the long-term. analytical thinkers and spend far too much time analysing things before coming to a decision. Well say I to these doubting Thomas’s, this may be correct but my belief is that everything that happens to us from the moment of our conception through to our birth and right back to the death of this physical body are all predestined and set out as a matter of Fate/Destiny. Therefore Fate/Destiny orchestrated the action of your Umbilical Cord being removed in a certain manner in order that your Navel would fit you like a Fingerprint and like a good picture would speak a thousand words about you – and its these “words” which are observed in Psychic Belly Button Reading. The above is just a very brief guide to the types of things I am looking for in a persons Belly Button when doing a reading for and it should be noted that for truly accurate readings I often like to have the person Day, Date and Time of Birth as well so that I can combine an element of Astrology to proceedings as well.